When Microsoft’s Surface Pro 3 was first introduced, much was made by reviewers (and those who’ve never used the machine) about it’s “lapability,” or how well it can be used (or can’t be) on one’s lap compared to a traditional clamshell notebook. Indeed, it appears that Microsoft invented the term to use when describing a positive feature of their Surface line of machines, while it’s since been commandeered by some as a knock against the Surface Pro 3. My experience has been that the Surface Pro 3 is actually more “lapable” than, say, my MacBook Air, specifically because it has two points of articulation instead of just one. 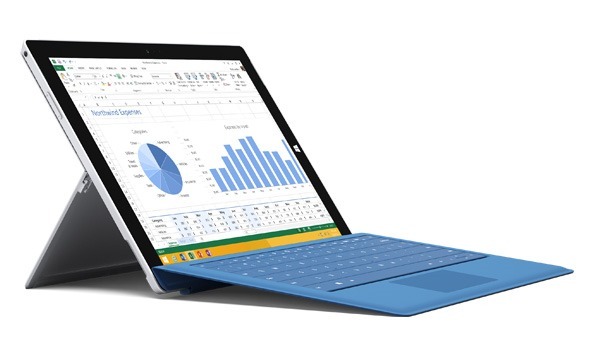 Whereas the traditional notebook has a single hinge between the screen and the base with a limited range of motion, the Surface Pro 3 has two: there’s the kickstand, which has a very wide range of motion, and the Type Cover, which can also be used at varying angles. These two hinges are independent of each other, and so, for example, I can sit in a very confined space and adjust the kickstand and the Type Cover separately to find a comfortable placement. To illustrate further, note that you can flip the Type Cover around when using the Surface Pro 3 as a tablet, and use the machine in the typical tablet positions (e.g., holding it upright when lying in bed). When you need to type something more substantial, you can simply flip the keyboard back around and use the kickstand to find a comfortable typing angle. It’s a contortionist’s dream. The following Microsoft video demonstrates some of the varying uses of the Surface Pro 3. Personally, I’ve yet to find a scenario in which the machine hasn’t been comfortable to use, something I can’t say about standard (inflexible) notebooks.